Special thanks to Danny Z (Zelisko) for the great concert last night at Celebrity Theater in Phoenix. 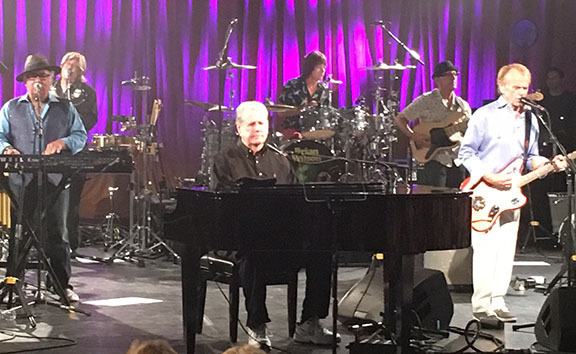 Beatific Brian Wilson took the stage to do, by his account, the very first song he wrote, "Surfer Girl," his best song, "God Only Knows" and about 75 other masterpieces, my favorite being "Don't Worry Baby," no wait, "Surfin' U.S.A." no, wait, "Dance, Dance, Dance," no wait, "Little Deuce Coup" no wait, "California Girls," no wait, "Fun, Fun, Fun," no wait, "I Get Around," no, wait, "Wouldn't It Be Nice," no wait, "Good Vibrations," no wait, "Barbara Ann" (which they closed with on the encore). (of Dino, Desi & Billy fame) at left, and Al Jardine, at right. 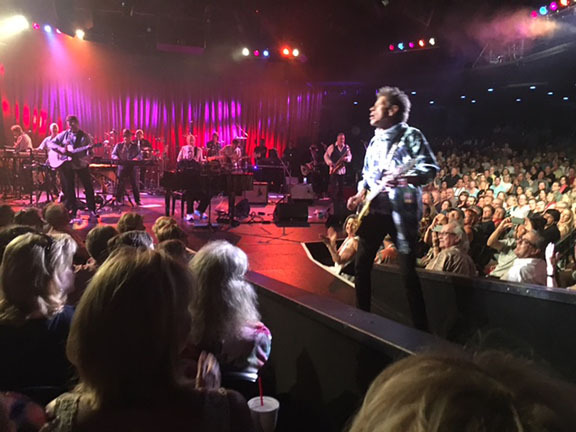 I counted 10 musicians, 11 if you count Blondie Chaplin, who came out three times and sang three songs, including "Wild Honey" and one of my favorite Brian Wilson songs ever, "Sail On Sailer." Blondie jams out in front of us on the gangway ramp. The Celebrity Theater is very intimate with a revolving stage in the center of the room, although for this show the stage was locked down or permanent, which blocked off about a third of the seats, so I'm guessing there were about 1,200 people in the audience. The show was sold out. 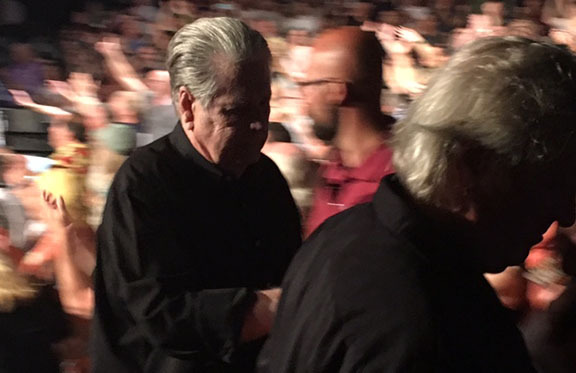 Last Brother Standing: Brian being led off stage to a chorus of "We love you Brian." The young lady sitting behind us told me she has seen the Beach Boys 11 times, which irked me because I have always bragged about seeing them 7 times, but never with Brian. I told her I first saw them in 1966 at the State Fair Grounds and I asked her how old she was at the time and she laughed and said she wasn't born until 11 years later! Brian's best friend and assistant (Dr. Eugene Landy light?) 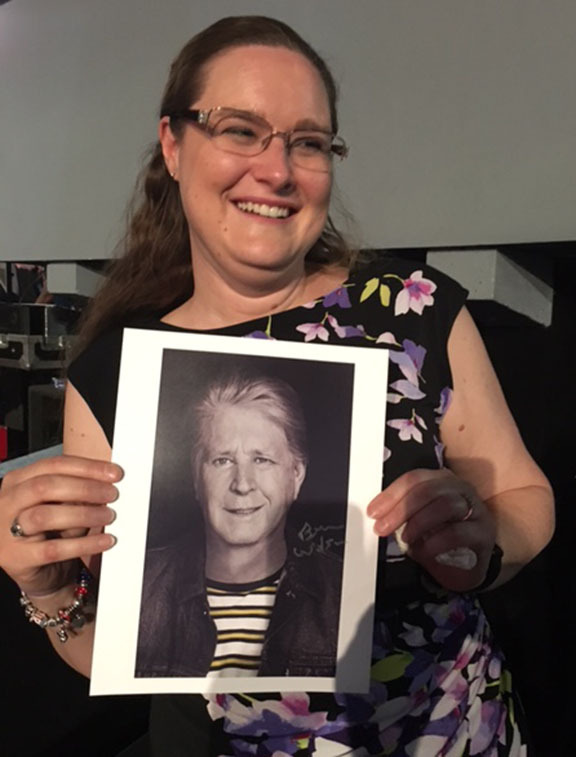 came out on the ramp and struck up a conversation with her and as the show ended he gave her this autographed photo of Brian. She cried. She's too young to remember but there was a time when the Beach Boys were considered passe and, dare I say, "embarrassing." I remember about 1966 being at an Exits band gig down at Bullhead City on the Colorado River, which always got a huge contingency of California kids and we were playing outside on the edge of a ball field, and we were in our Beach Boys striped shirt phase with the white Stratocaster Fenders and the clean cut surfer look. There were these three or four "California girls," and they were all dressed in old army jackets, early grunge. This was the leading edge of The Summer of Love (1967) and the coming hippie movement and we were stuck in the backwater of Kingman and didn't know any of this. Anyway, the girls laughed at our Beach Boys songs and told us they were so out of style and stupid. They were into the Stones. It was the beginning of a dark time for the Boys. The Beatles, the Stones, The Who and a hundred other British Invasion bands eclipsed all of that sunshine, and it was thought by the powers that be that Brian needed a lyrics co-writer, someone who wouldn't allow him to write something so sappy as, "Be True to Your School" ("just like you would to your guy or gal") so they hired Van Dyke Parks to give The Beach Boys some edge in 1966. it didn't work, of course. Hard to believe now, that is, hard to believe anyone needed to mess with Brian's mojo. The songs about surfing (even though most of us didn't live near an ocean) and cars and cokes spilled on your girlfriend's blouse, are so timeless and dead on. And Brian spoke so directly and so eloquently, at least to a lonely teenager trapped in his room in a backwater town in northern Arizona. We do love you, Brian. It was an honor and a pleasure to see you, finally. "There's a place where I can go and tell my troubles to. . ."
—The Beach Boys, "In My Room"
"There's one more thing, I've got the pink slip, Daddy." —The Beach Boys, "Little Deuce Coup"